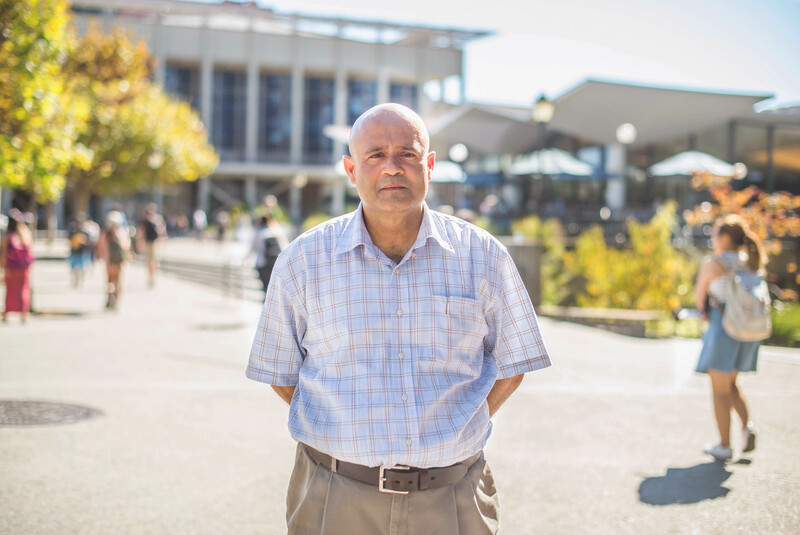 In 1991, Liladhar Pendse was working in food services at UCLA Catering after a move from the Soviet Union in search of a fresh start. A polyglot fluent in seven languages and familiar with an additional 13, Pendse frequently visited the library to borrow books from Russia and India. There, he encountered a librarian who ended up changing the course of his life. Twenty five years and four degrees later, Pendse combines his passion for diversity, his love of language and his quest to share knowledge and information as a scholar librarian at UC Berkeley. This month, Pendse’s rich understanding of global materials is on display in an exhibit of comics and graphic novels from a dizzying array of cultures, including Egypt, Poland, South Africa, Israel, the Czech Republic, Colombia, and Japan. “Beyond Tintin and Superman: The Diversity of Global Comics” can be viewed in Doe Library’s Bernice Layne Brown Gallery through March 2017. Pendse hopes that the exhibit will inspire viewers to reflect on issues treated in the materials — around censorship, race relations, political agendas and gender biases. From India to Belarus and the U.S.
Pendse grew up primarily in Mumbai, but spent parts of his youth in several regions of the then-Soviet Union due to the tumultuous political climate of the time. Although he had earned an M.D. in Internal Medicine in Belarus, Pendse realized he had to start over when he moved to the United States. He worked a variety of jobs while living in Los Angeles, and eventually found that education was his path to success. He earned his BA in History and Arabic/Islamic Studies with honors from UCLA in 2004. 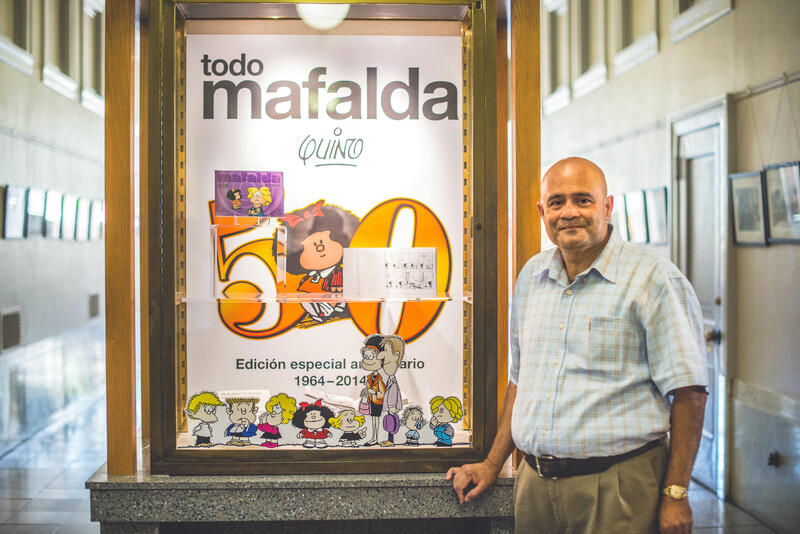 After working in the UCLA library, he earned his MLIS and an MA in Latin American Studies. Following positions at UCLA’s Library and at Princeton, he came to Berkeley’s University Library in 2012. In 2013, he defended his Ph.D. at UCLA. Growing up in three very different cultures inspired Pendse to focus his work on inclusion and acceptance of different types of people. He hopes that the materials in the “Beyond Tintin and Superman: The Diversity of Global Comics” exhibit help break down cultural barriers by offering authentic, personal accounts of social and political issues around the world. The comics on display were curated by Pendse and include comics from his own personal collection. There is a copy of the DC Comics 1987 classic, Watchmen, as well as graphic novels and comics covering atomic bomb survivors, young Yemeni women forced into marriage, a collection created in response to the January 2015 terrorist attack on the French satirical weekly magazine Charlie Hebdo, love in a Japanese boys’ boarding school, and a translation of a two-volume work of a French professor of Middle Eastern studies/historian and an award-winning artist that tells the complicated stories of the United States involvement in the Middle East. At UC Berkeley, Pendse’s title is as long as an arm — Librarian for East European, Armenian, Caucasus, Central Asian, Balkan, Baltic, and Mongolian Studies, and Acting Librarian for African Studies. His knowledge of many different languages has empowered him to work effectively across a diverse group of faculty, students and visiting scholars. Along with fluency in Marathi and Hindi/Urdu, Russian, Gujarati, Portuguese, Spanish, and English, he is at an intermediate level in Azerbaijani, Sanskrit, Arabic, and Turkish; and basic in Armenian, Romanian, French, Italian, Swahili, Polish, Bosnian-Croatian-Serbian, Slovak, and Turkmen. Previous exhibits Pendse has helped curate include displays of posters and printed works from Cuba and Soviet Union during the Cold war, and on the 1867 purchase of Alaska, highlighting the Library’s Russian-American collections. He is involved in planning several future exhibits, one on popular literature in Brazil, and another on Bollywood and Africa. Ron Turner is the founder of the Last Gasp, a book and underground comics publisher and distributor based in San Francisco. UC Berkeley Lecturer Ivy Mills, Ph.D. specializes in the visual and literary cultures of Africa and the African diaspora. The Library attempts to offer programs in accessible, barrier-free settings. If you think you may require disability-related accommodations, please contact the event sponsor prior to the event. The event sponsor is Ashley Bacchi, 510-664-7737. Picasso in your home? Exhibit honors 60 years of sharing art. Which American presidents have visited UC Berkeley?